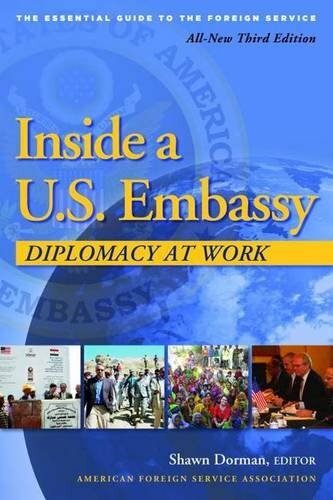 Inside a U.S. Embassy: Diplomacy at Work, All-New Third Edition of the Essential Guide to the Foreign Service@1088 Rs [Mrp:-1088] - Onlinedeals.discount - A leading product discovery website. Find the true prices of products, read reviews and buy top brand products at reasonable prices. Inside a U.S. Embassy is widely recognized as the essential guide to the Foreign Service. This all-new third edition takes readers to more than fifty U.S. missions around the world, introducing Foreign Service professionals and providing detailed descriptions of their jobs and firsthand accounts of diplomacy in action. In addition to profiles of diplomats and specialists around the world–from the ambassador to the consular officer, the public diplomacy officer to the security specialist–is a selection from more than twenty countries of day-in-the-life accounts, each describing an actual day on the job. Personal reports from the field give a sense of the extraordinary challenges–the coups, the natural disasters, the civil wars–and rewards of representing America to the world. Inside a U.S. Embassy includes new chapters on the highly competitive Foreign Service entrance process, Foreign Service life outside the embassy, and briefings on topics such as handling high-level visits and service in war zones.